Daisy is our very colourful Nigerian Dwarf doe who was born on our farm in 2017. Daisy was part of a set of twins. Her brother, Alfalfa, also had some very beautiful markings! Daisy, however, is almost the identical image of her mom, Delilah, and her sire is Prince. Daisy a very sweet and playful doe. She has been very friendly ever since she was young, and just loves to be the centre of attention. She is also very photogenic, and seems to always have some really cute photos taken of her! 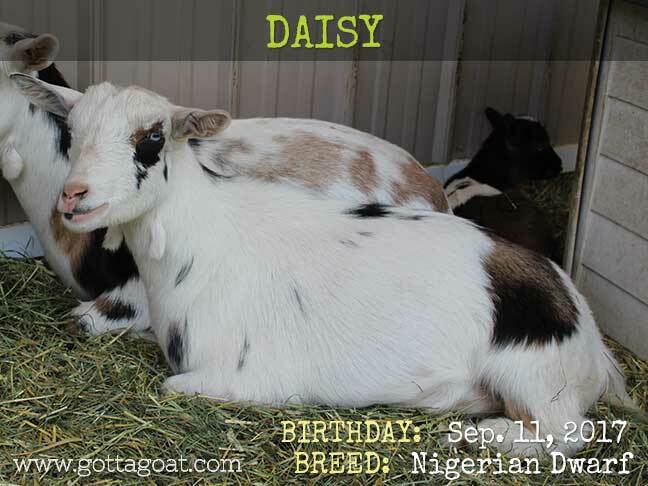 Daisy is polled (naturally hornless), has beautiful blue eyes and wattles, and is an unregistered Nigerian Dwarf doe.